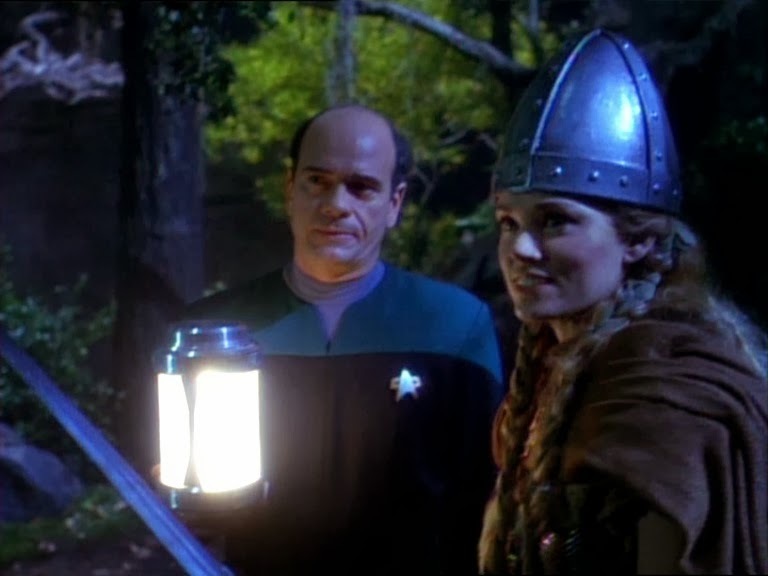 The Doctor might be my favorite Voyager character. It's one of those things that sort of wavers day by day. But, through all these years, each time I watch the series, as much as I love Janeway, Seven, B'Elanna, and Neelix, I tend to keep coming back to The Doctor. I love the way his character develops, I love the way he's played, and I love the episodes that were written for him. He's Voyager's Spock/Data/Odo. He spends seven seasons exploring his humanity, trying to better understand what it means to be a person, what it means to create and develop relationships and, occasionally, what it means to fall in and out of love. In Heroes and Demons he saves the day but not the girl. Freya, a badass viking maiden goes to her untimely death after bestowing a kiss on The Doctor. His first kiss. It's a holodeck kiss but it's not without meaning. My first kiss was similar. I was in Romeo and Juliet when I was fifteen and I'd never kissed anyone. I still remember standing in the rehearsal hall with my Romeo, in the middle of the summer, sweating through my Sailor Moon t-shirt and leaning in for my first kiss only to bump teeth in front of all the Montagues and Capulets. It might not have been a kiss borne out of love (even puppy love) but and thus not "real" but, in spite of the falseness of the situation, it still meant something to me. It's The Doctor's first date and, like anyone's first date, it's awkward and sweet. And, again, just because the setting, the main character and the body of the leading lady aren't physically real, that doesn't mean that real emotions aren't involved. The Doctor and Denara are overtaken by a storm of happiness, excitement, trepidation, anxiety, and fear of rejection. This episode is beautiful and quiet in its exploration of The Doctor's character, his first real romance, and his newfound ability to truly fall in love. Watch it. I look at that 57 Chevy on Mars and think, "Tom Paris you delightful weirdo". Dancing with Denara at the end of “Lifesigns” is one of the Doc’s finest moments. 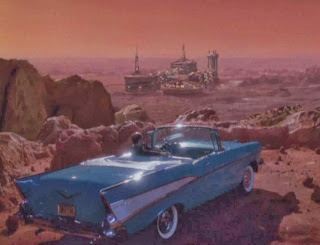 Mars sure looks balmy in that parking scene. Funny how the car radio song on the Netflix episode is “Only have eyes for you” (the Flamingos) while the DVD version has “My Prayer” (the Platters).